Syrian leader Bashar al-Assad has said he is committed to a plan to destroy his country’s chemical weapons but warned it could take about a year. Speaking to Fox News,Bashar al-Assad again denied claims that his forces were responsible for a deadly chemical attack near Damascus on August 21. The Syria disarmament plan was unveiled by the US and Russia last weekend. The West wants the deal enshrined in a UN resolution backed by the threat of military force, but Russia objects. Damascus – backed by Moscow – has insisted that rebel forces carried out last month’s attack in the Ghouta area. In a separate development, fierce fighting has been reported between two rebel groups in the north of Syria. Activists said the fighting began when jihadists from the al-Qaeda-linked group, the Islamic State of Iraq and the Levant (ISIS), and fighters from the Western-backed Free Syrian Army (FSA) clashed in the town of Azaz, near the Turkish border. This is believed to be one of the biggest confrontations so far between the jihadists and the FSA. Referring to the issue of destroying Syria’s stockpiles of chemical weapons, Bashar al-Assad said it was “a very complicated operation, technically”. “And it needs a lot of money, some estimates about a billion. 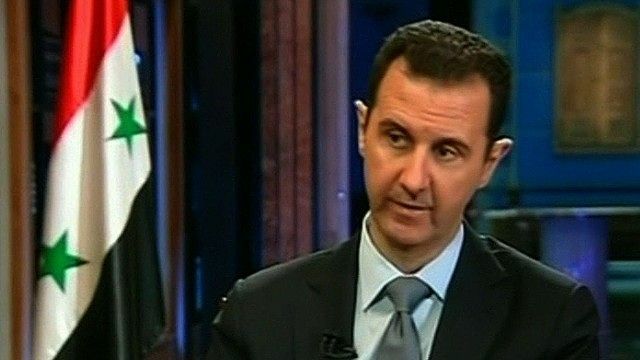 Bashar al-Assad also used the one-hour interview recorded in Damascus to criticize the US stance in the Syrian crisis. Unlike the Russians, he said, Washington had tried to get involved in Syria’s leadership and governance. Bashar al-Assad argued that if there was mutual respect, there would not be any problems. “Listen to your people. Follow the common sense of your people,” he said, in an apparent reference to US President Barack Obama. Bashar al-Assad’s comments come shortly after a senior Russian diplomat said Damascus would fulfill its commitment to eliminate its chemical weapons by mid-2014. After talks in Syria on Wednesday, Deputy Foreign Minister Sergei Ryabkov said Bashar al-Assad was “very serious” about the disarmament plan. Sergei Ryabkov also said that Syrian officials had handed him “material evidence” that showed the rebels were involved in the sarin attack last month, contradicting claims by the US that the regime was responsible. And the Russian diplomat criticized the United Nations for being “one-sided” in its recent report on the attack – a claim the UN denied. The report – prepared for UN weapons experts after a visit to Syria – did not apportion blame for the August 21 attack. Meanwhile Germany’s Chancellor Angela Merkel has said in an interview on German television that chemicals exported to Syria which were capable of being used to make poison gas were used for civilian purposes. The German government, responding to a request from a member of parliament, said 137 tonnes of two substances capable of being used to make the poison gas, Sarin, were exported to Syria between 2002 and 2006. Angela Merkel added that officials were still trying to ascertain what use was made of chemicals exported after 2006 and before May 2011, when Germany imposed strict controls on exports to Syria. More than 100,000 people have been killed since Syria’s civil war began in early 2011, according to the UN. Millions of Syrians have fled the country and millions more have been left homeless.